Cats aren’t usually the first choice when it comes to getting pets for kids. They are always considered as cold, aloof, and therefore not suitable as companions for children. On the contrary, kitties can be the best friend that your kid would ever have at a young age. Kids’ behavior and future outlook in life can be easily shaped by their environment, the people or in this case, even pets around them. Just like with dogs, children can also learn a lot from their companionship with the felines. Below are some of the life lessons that they can learn from them. Having to take care of another creature promotes responsibility at a young age. Some cats are not that hard to maintain compared to dogs. This makes them perfect for kids as a companion. They’d learn to be responsible by doing little things such as feeding them, brushing their hair from time to time or just by emptying the cat’s litter box. This simple involvement with the welfare of a furry family member can go a long way as kids grow up. Not all cats are up to play all the time. Sometimes, they won’t be able to match the energy that a kid has. Cats appreciate a little time alone, especially after a long day. In fact, most kitties sleep from 16-20 hours a day. With a pet cat, kids will learn how to respect boundaries by learning when is the right time for play and for a time out. They’d also learn what part of their pets is okay to touch. Cats are especially particular on this and can get a little snarky when they don’t like it. They’ll surely ask for some attention after a while though. 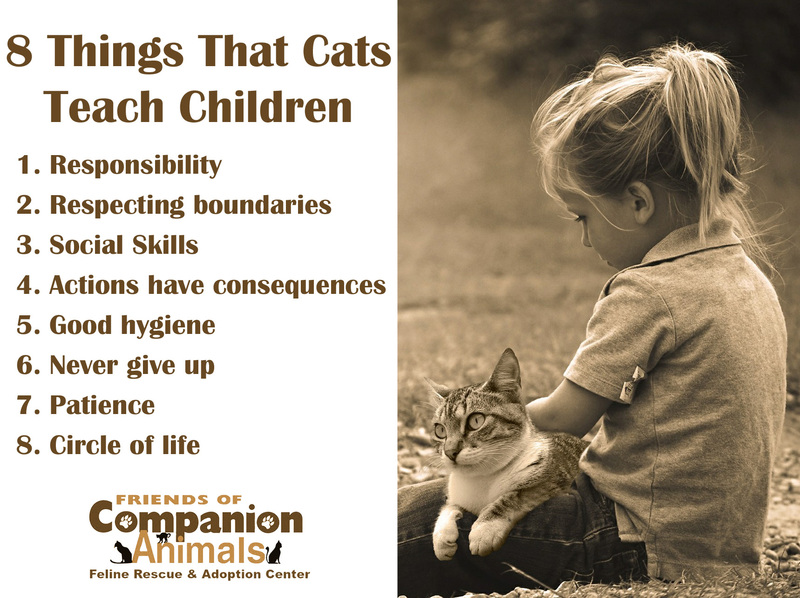 In connection with respecting boundaries, kids can also learn how their behavior affects their cats. Their pet cat can be their first friend that they can bond with. How the kids interact with their feline friend can help with their social interaction with human friends as they go on. As they interact with cats, they can learn some basic concepts such as friendship. For much younger kids, they can also learn to communicate since some cat breeds enjoy a little chit-chat. Cats are very gentle animals but like humans, they too can be irritated when provoked. Kids can be a little too active and pull on their tails or pet them too hard. Of course, some cats will react negatively to it. Their feline friend can either swipe and hiss at them or may even give them a few scratches. With this, kids can learn that their actions may induce negative reactions from others and they can get hurt in the process. This kind of experience will teach them to think before acting. Cats are notorious for their personal hygiene. It’s easy to litter-train them and they naturally groom themselves by licking their paws and coat. Meanwhile, some kids can be stubborn when it comes to brushing their teeth or sometimes even taking a bath. Their pet cats can be a good example if they give their parents a hard time when it comes to these things. Kids can learn the importance of being clean from their feline friends. Children are a little bit sensitive and would easily cry whenever they get hurt. They might stop doing one thing just because they fell down once or they were affected negatively in the process of doing it. As you can observe, cats can be persistent when they want to do something. May it be climbing up a tall shelf or chasing down that red laser light. Although kids can’t literally learn to bounce back on the floor in all fours whenever they fall down just like cats do, they can bounce back from their failures and learn to never give up easily in every obstacle that they face. A new pet cat may take some time to get used to its surroundings. At first, it can try to be alone and hide at corners. On the other hand, children can tend to be impatient when they want to do something, especially when there’s a new friend around. They need to understand that they have to give their pets time to adjust. They also need to be patient whenever they want to teach their pets new tricks or when they want to play. Kids can learn that they can’t get everything they want right away and that some things take time. This may be the hardest lesson that kids might have to learn. Unfortunately, their pets can’t live as long as them. The average lifespan of a common cat is between 0-15 years, depending on its lifestyle. This means that they might experience an inevitable loss at an early age. Kids might not understand it at first but as they go on, they’d learn not to dwell too much on the death and loss but focus on the memories that they’d made with their furry companion instead. 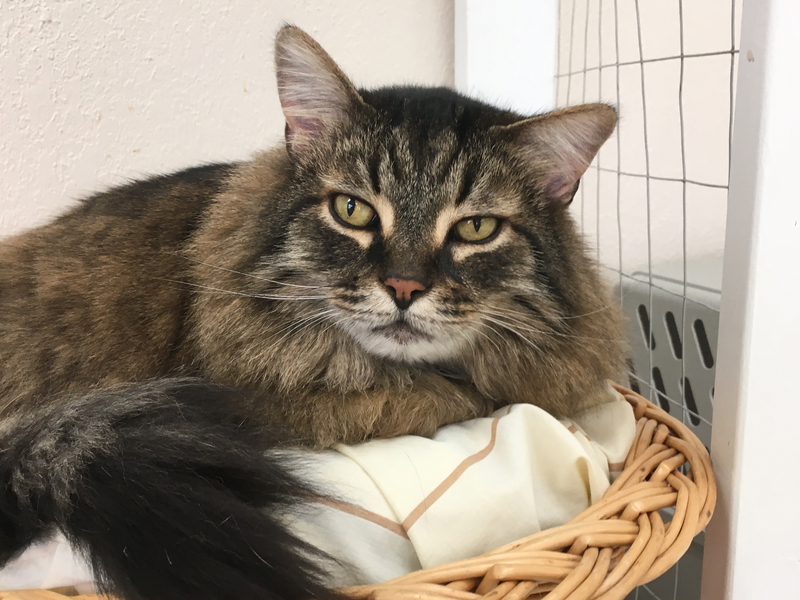 Friends of Companion Animals, Temperance, has received an $800.00 Petfinder Cat Enrichment Grant from the Petfinder Foundation. Petfinder and the Petfinder Foundation believes every adoptable cat deserves to be happy while they are waiting to be adopted. The Cat Enrichment Grant program was awarded to Petfinder organizations by providing funds to purchase cat enrichment toys to stimulate their minds, making them more adoptable. Friends of Companion Animals posts its adoptable pets at www.petfinder.com/shelters/MI918.html. The Petfinder.com Foundation assists the 12,000+ animal shelters and rescue groups that post their adoptable pets on Petfinder.com. A nonprofit 501(c)(3) organization, the Petfinder Foundation helps adoption organizations find homes for the pets in their care through its Sponsor A Pet, Disaster Fund, Quality of Life and other programs. Since its founding in 2003, the Petfinder Foundation has given more than $20 million in cash and product grants to shelters and rescue groups in the United States, Canada and Mexico. Friends of Companion Animals in Monroe, MI has received an $878.00 Senior Pet Adoption Assistance Grant from the Petfinder Foundation. The Petfinder Foundation Senior Pet Adoption Assistance Grant program is used to assist Petfinder members to help facilitate the adoption of senior pets. Grant funds must be used to help senior pet become adoptable by funding any of the following: adoption fees, transportation to the adopter, assist the adopter with the cost of medication for the duration of the senior pet’s lifetime, spay/neuter surgery. This money will go a long way in helping F.O.C.A. to match senior cats with senior citizens. Friends of Companion Animals posts its adoptable pets at www.petfinder.com/shelters/MI918.html. Visitors are welcome to meet cats face-to-face during their normal business hours Thursday through Saturday from 11 AM – 5 PM. The Petfinder.com Foundation assists the 12,000+animalshelters and rescue groups that post their adoptable pets on Petfinder.com. A nonprofit 501(c)(3) organization, the Petfinder Foundation helps adoption organizations find homes for the pets in their care through its Sponsor A Pet, Disaster Fund, Quality of Life and other programs. Since its founding in 2003, the Petfinder Foundation has given more than $20 million in cash and product grants to shelters and rescue groups in the United States, Canada and Mexico. Come visit us on Saturday Dec. 8th and enjoy games, refreshments and fun for all ages! 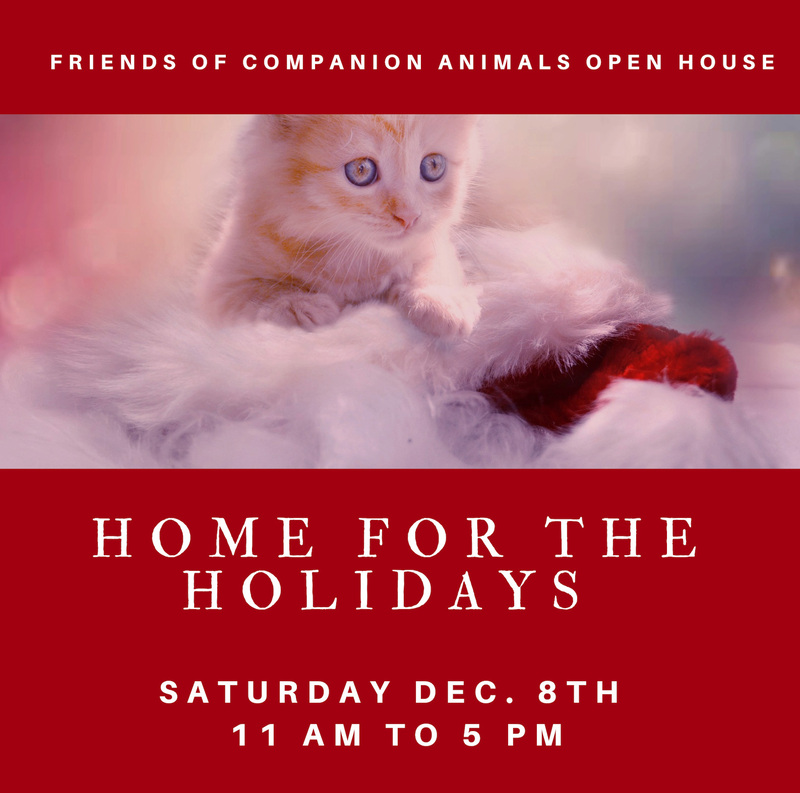 Home for the Holidays is an open house / cat adoption event on December 8thth, hosted by Friends of Companion Animals, the area’s only all-cat rescue. 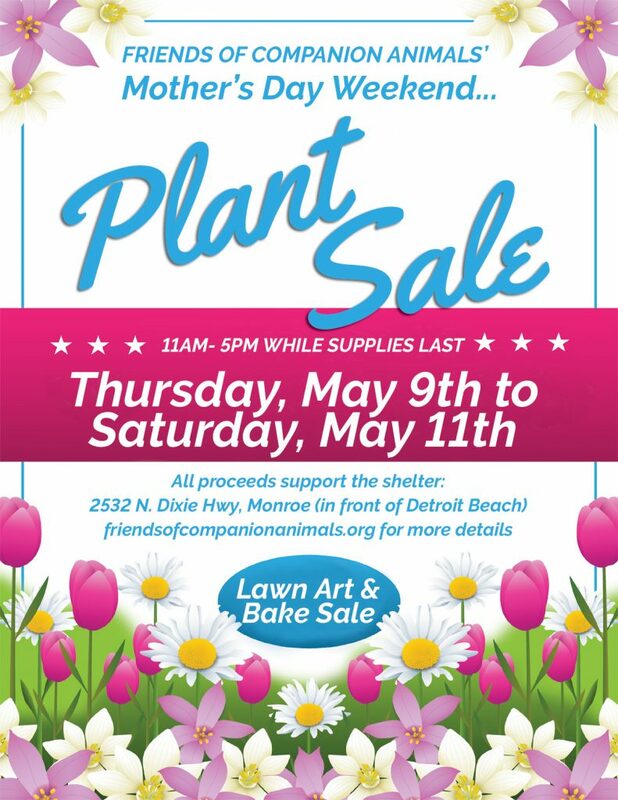 Guests are invited to food, drinks and games at the shelter located at the front of Detroit Beach off N. Dixie Hwy in Monroe. Plus, anyone who attends with a bag of Purina Cat Food, 13 pound or larger, or a 35 pound pail of Tidy Cat Clumping Litter, could win a $50 PetSmart gift card! In addition, the more supplies you bring us, the greater your chance of winning since each item provides you a ticket in the drawing! For example, bring a large bag of Purina food and pail of Tidy Cat litter (since we are brand specific) and you’ll get two tickets! It’s a great way to meet our cats and kittens face-to-face and perhaps put in an adoption application for a feline best friend because there’s no place like home for the holidays! Halloween is one of the most favorite times of the year for many people. It’s great to dress-up and give out candy to happy ‘trick or treaters’. Still, this all this fun we need to be mindful of its effects on our pets. Some pets love the commotion of Halloween and they even love to wear costumes or walk with their pet parents through the neighborhood. Others, however, might not. This is usually true of most cats. The commotion of shouting, ringing doorbells, etc. can make even brave cats and kittens scared. Sometimes they might run for cover in the house. At other times it might be out the front door. So here are five Halloween tips for cats so you can keep them safe this week as you celebrate. FAST. The speed and nimbleness of a cat who is determined to escape the house is second to none. 2. Consider a collar for the evening if they don’t normally wear one. Even when confined, make sure they are wearing identification and/or has been microchipped. It’s also a good idea to keep them separate from your Halloween party guests at your home. With people coming and going it’s easy for them to slip out. 3. Keep Treats secure. Chocolate, while yummy to humans, can make cats and dogs sick, and sugar-free candy containing xylitol which can be deadly. Crinkly wrappers often mimic the sound of toys to cats like, and if accidentally ingested become harmful. 4. Avoid hazardous decorations. Although pumpkins and decorative corn aren’t considered nontoxic, they can produce stomach discomfort in pets. Furthermore, the fun, fake spider-webbing can be dangerous to kittens, cats and other pets, too. In addition to becoming tangled in it, it can be deadly when ingested. 5. Use pet costumes on a case by case basis. Yes, they can be photo worthy. But consider that animals, especially cats, rely heavily on all their senses to avoid danger. Costumes that cover ears impacts hearing. And some dress-up options interfere with their whiskers or their range of vision. It can make them feel vulnerable and raise your pets stress level. Some costumes might have potentially dangerous strings or ribbons too consider. The bottom line? While costumes make a great photo op, consider how your pet will respond and take the proper action. These five Halloween tips for cats can help you make sure this Halloween is fun and happy time for everyone, including your feline (and canine) family members. “Chance” was found near PetSmart in Monroe, MI and brought into the store. Friends of Companion Animals (FoCA) cat rescue center was called to see if we could help him. A microchip scan revealed that he is been adopted in August 2017 at four months old to a home in Southfield Michigan from a rescue located in Walled Lake, Michigan. His adopters didn’t report him missing and they had him declawed, which is against the organization’s policies. Because of this contract breach, the rescue has retained custody of Chance. Since he is now back in their possession, they are responsible for his medical costs and care. In fact his original foster from when he was a kitten will be fostering him during his recovery. After the veterinarian examination, it appears that his jaw is dislocated or broken. They surmised that the injuries he sustained are consistent with riding under or inside the engine compartment of a motor vehicle and ultimately falling from that vehicle. Below are some additional images but they are more graphic in nature. However, it illustrates the extent of his injuries and why funds for his care are desperately needed. 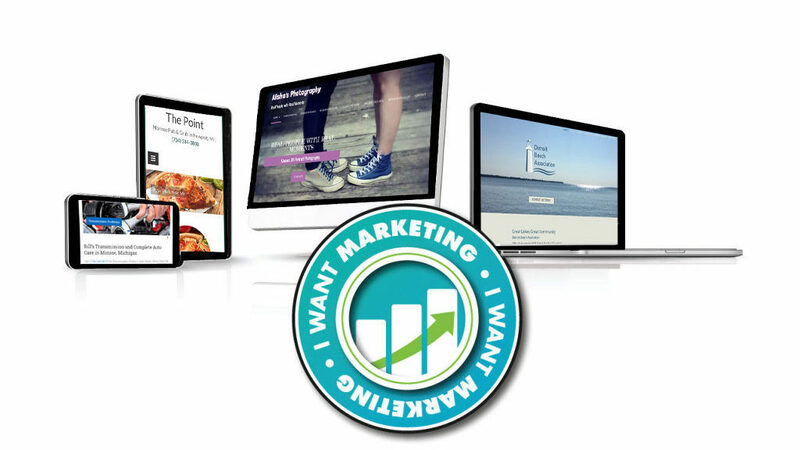 Friend of Companion Animals would like to offer our thanks to I want marketing.com. For every site they build for a business they also construct one for a local nonprofit animal organization. We are very honored and happy that they chose our feline rescue and adoption center. Along with information about our facilities, this site will also include a list of our adoptable animals, which appear on Petfinder, in the coming weeks so stay tuned. And if you are in need of a new website make sure to check them out because you’re not only helping a Monroe-based web design business you’re also helping other homeless pets in the process. Friends of companion animals would like to thank all of the attendees of our fifth annual auction fundraiser, which was held Saturday, October 21, 2017. People came out to enjoy a delicious dinner and bed on a variety of items, from gift cards to local businesses to gift baskets and more. As a completely volunteer run, nonprofit organization, all proceeds from our auctions go directly to support the care of our shelter and its felines. It’s always wonderful when people come out to support our endeavor of making Monroe County, MI free of homeless and unwanted cats. So again, we like to extend our thanks to everyone who donated items and to everyone who show up for our events. Your generosity is greatly appreciated. Cats and barns have a symbolic relationship practically dating back to when man first began practicing agriculture. All of the stores of grain attracted rodents, which in turn, attracted feline hunters. Seeing their usefulness, farmers thought it might be a good idea to keep cats around and so began the domestication of these graceful, skilled hunters. 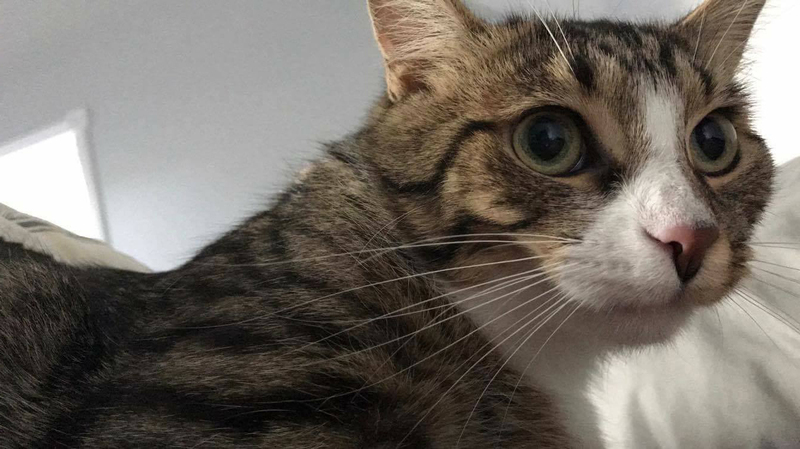 Though many cats are friendly and might be better at offering companionship than pest control, they are still, as a species, relatively new to the process of domestication. Some feral cats might remind you for a racoon than your fluffy house kitty. In between the lounging house cat and the street fighting alley cat, we have the timeless barn cat. While we at Friends of Companion Animals always trying to find suitable homes for our feline wards, some cats are just happier when they aren’t confined indoors. They are not entirely feral and will typically tolerate some level of human interaction. These are the felines we find to be the happiest living in barns, hunting out pests and getting by with a little supervision and care from the lucky barn owners to whom they provide their services. If you feel you could use the services of such a useful feline in exchange for shelter, food, and water, come visit our shelter and let one of our volunteers help find the right mouser for you. Just like the companion cats we care for, these barn cats are spayed or neutered and vaccinated before their re-homed. 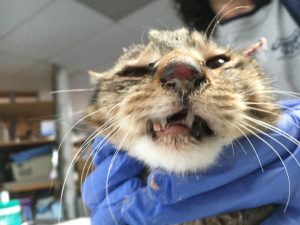 While we do not charge a fee for adopting these barn cats, we do appreciate donations to help offset the $100 in medical costs that make them ready for your barn or garage. Most people tend to think that once aa cat is diagnosed with feline immunodeficiency virus the best course of action is euthanasia. 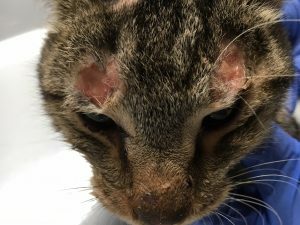 While FIV is a lifelong disease and affected cats do require special attention, it hardly means the feline cannot live a fulfilling life without spreading the virus. FIV is commonly thought of as the feline form of HIV, but it’s only a risk to felines. Like HIV, it weakens the immune system, making infected cats more susceptible to other diseases. 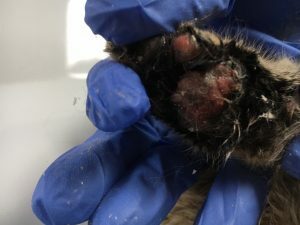 Unlike its more highly contagious cousin, feline leukemia, IV is mainly transmitted when an infected cat bites or scratches other cats earning it the title of a “fighting cats disease”. It can also be passed from mother to kittens, but only if the queen is infected while nursing or pregnant. 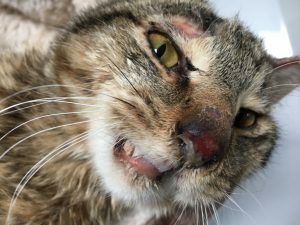 What happens to FIV infected cats? Friendly cats continue to live a happy life for many years before the virus reaches its final, chronic clinical stage and the pet begins to show signs of illness. In the meantime, these cats are best kept indoors and away from other cats. 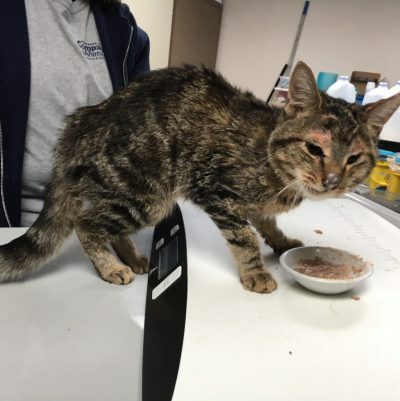 This separation is not just to prevent the infected cat from spreading the virus, but also to protect the infected cats, with its weakened immune system, from contracting any other illnesses that other cats might be carrying. Some people might choose, in a situation where all cats are friendly and do not fight, to offer these special felines companionship by adopting multiple FIV cats. As long as they are monitored for any signs of sickness and kept away from potential sources of other diseases, they can live happily as typical house cats. At our shelter, we have FIV cats for adoption. They are all extremely friendly with people, as well as other cats. We keep them away from the other shelter cats, more out of concern for their health than concerned that they might bite or scratch to pass the virus. If you can offer a safe, loving home with a little extra care, stop by our shelter and meet the sweethearts. They have as much love and life to offer as any other.